This page will guide you through configuration and basic use of the CRM Connect Microsoft Dynamics CRM Add-in.It is expected that you are already familiar with the Address Book, Call History and Preview window, and the basic concepts of integration and screen popping using the Add-ins.See the 'User Guide' for these topics. Microsoft Dynamics CRM and the database used to store your contact data should already be installed and working normally before proceeding with this integration. Right-click the CRM Connect tray icon in the system tray menu and then left-click the 'Configuration' option from the menu that pops up, this will open the 'configuration' screen.In the 'Integration' area, click the 'Add new' button, select 'Microsoft Dynamics CRM' from the 'Type' dropdown box and then click the 'Set' button. First select the method you use to log in to Microsoft Dynamics CRM. On the 'Deployment type', select which type of Microsoft Dynamics CRM you use. If you choose (CRM Online) for log in enter your Windows Live ID information, including which of Microsoft's server groups you log on to (Europe, Asia-Pacific, or Americas). 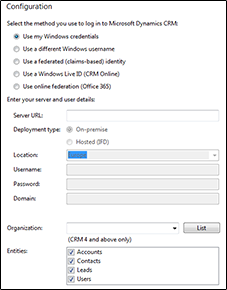 If your Microsoft Dynamics CRM server is available on your LAN, select 'On-premise'.Select 'Hosted (IFD)' if it is over the Internet but not via Microsoft CRM Online.For either case, in the 'Server URL' text box, you need to enter the web address you visit to access Microsoft Dynamics CRM e.g. http://mscrm/.You'll find this info in Internet Explorer's address bar when you login to Dynamics. Under the 'Server URL' box, select which type of authentication to use.Most users will be able to use the 'Use Windows credentials' option.If you are prompted for username and password when loading Microsoft Dynamics CRM in your browser, uncheck 'Use Windows credentials' and enter the relevant details in the 'Username', 'Password' and 'Domain' textboxes below it. For those of you using version 4 or above of Microsoft Dynamics CRM, your organization needs to be selected also.After entering all of the details above, click 'List' and all the organizations that your user has access to will be listed in the 'Organization' box.Usually your user will only have access to one organization. Select which of your Dynamics account modules you want to be used by checking the corresponding boxes in the 'Entities' section. To test if the configuration worked, enter a phone number from your Microsoft Dynamics CRM account into the 'Telephone' box in the 'Integration test' area and click the 'Search' button.The results will be displayed after a few seconds.